* This review may contain spoilers for the previous books in the A Court of Thorns and Roses series. To Sum It Up: Feyre is back at the Spring Court, covertly plotting to undermine both it and its High Lord while also discovering what the King of Hybern has planned next for Prythian and the human lands below the wall. War is inevitable, but even that may not be enough to convince all the High Lords to set aside their usual squabbling among themselves and unite against their common enemy, Hybern. Feyre, Rhys, and their family are ready to stand against the massive invading Hybern army, even if they cannot rally any other courts to their side. 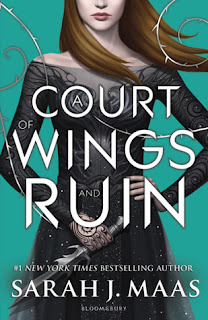 Review: After reading seven Sarah J. Maas books and being utterly annihilated by Empire of Storms last year, I prepared for the absolute, rock-bottom worst going into A Court of Wings and Ruin. I expected the Ruin part of the title to describe what was left of my heart after reading this because that’s become the norm post-Maas books. Surprisingly, I don’t feel too wrecked. While there are plenty of intense, heart-stopping moments throughout A Court of Wings and Ruin (like the end of every chapter), I’m not the shattered wreck I was at the end of Empire of Storms. Fine, I may have almost cried a few times during A Court of Wings and Ruin. Maas certainly knows how to squeeze the reader’s heart to its bursting point. A Court of Mist and Fury ended on one hell of a tumultuous note, with Feyre’s sisters, Nesta and Elain, being turned into Fae against their will and Feyre headed back to the Spring Court, vowing to make Tamlin pay for allying with the King of Hybern in exchange for the latter’s aid in finding her. 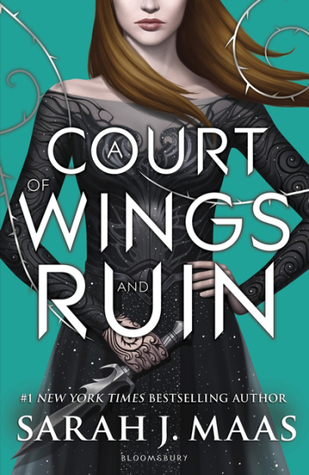 A Court of Wings and Ruin picks up with Feyre back at the Spring Court, outwardly acting like she’s relieved to have been “rescued” from Rhysand and the Night Court. Meanwhile, Feyre is collecting intel on what Hybern is plotting and setting up the Spring Court to collapse around Tamlin. This second part of her plan has unforeseen consequences down the road, however, and I thought it was important to show that Feyre could still make mistakes after becoming the insanely powerful High Lady of the Night Court. As much as I love badass heroines, I also like to see them grounded and not ridiculously perfect. Maas does an excellent job here of keeping Feyre a well-rounded protagonist. The hell that is war hits hard in A Court of Wings and Ruin, as Prythian braces itself for Hybern’s invasion. The battle isn’t only against an external enemy, either. The Fae High Lords, accustomed to years and years of infighting between the courts, must decide who represents the bigger threat: Hybern, which stands to destroy both Fae and humans alike, or their fellow High Lords. Even if the courts somehow manage to band together, they face a formidable foe, especially with the King of Hybern wielding the crazy powerful Cauldron. Maas always writes fantastic action scenes, and they’re as pulse-pounding as usual in A Court of Wings and Ruin. She vividly conveys the sheer terror and chaos of battle. I frequently had to avert my gaze from further down the page, especially whenever I reached the end of a chapter, because I feared so damn much for Feyre, Rhys, Cassian, Azriel, Mor, Amren, and even Feyre’s sisters. Awaiting the outcome of each confrontation with Hybern on the battlefield was almost too much to handle. Feyre, Rhys, and their friends are a family, and they’re all prepared to sacrifice themselves if it means saving everyone else. My only quibble with the book was the same one I had with Empire of Storms: the pacing. Both novels clock in at about 700 pages, and to me, both could have told their stories a bit more succinctly. I’m not sure what the original plan was for the number of books in this series, but A Court of Wings and Ruin tries to both bring this story to a close while also setting up possible plotlines for future books. Sometimes the flow between the two didn’t feel quite seamless, but the ending was very satisfying nonetheless, and I’m curious to see the direction the series heads in from here. All in All: Taking on a 700-page book is absolutely daunting for me these days, but being back in this world with these beloved characters was like going home to catch up with old friends. A Song of Ice and Fire/Game of Thrones fans looking to get their fix between books/season should definitely give this series a shot. Thanks, Charlene, lol! I was prepared to need lots of therapy after reading this, but it wasn't that bad! :D Books over 500 pages scare me more than they used to because I've been reading sooo slowly lately, but it was very easy to get into ACoWaR. Listening to it on audio is a great idea! I can't wait to see what you think of it! I loved this book so much! I totally agree with your sentiment about this book being like re encountering old friends. What a pleasure! I'm glad you loved ACoWaR, too! I didn't realize how much I missed these characters until I was back in their world!